This is a typical Portuguese mariner's astrolabe, which is equipped with a suspension-ring and a weight to maintain its stability. The degree scale is only marked on half of the instrument. 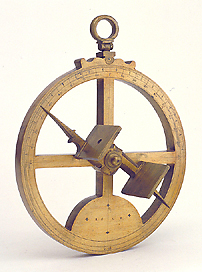 The alidade, which is mounted at the centre of the instrument, bears two large square plates, one of which is pierced. The instrument could be used to measure the height of the sun, by permitting a ray to pass through the hole in the front plate to be projected as a luminous point on the opposite plate. The astrolabe is the work of the Portuguese craftsman Francisco de Goes and came to belong to the Medicean collection after the death of Robert Dudley, together with the other nautical instruments left in a bequest to Grand Duke Ferdinando II.